The unprecedented accommodative monetary policy stance implemented across the world in recent years has pushed interest rates to the zero lower bound, and even into negative territory. Based on an analysis of regulated floors and ceilings in bank loan and deposit interest rates in China, this column argues that when lending rates are close to regulatory imposed floors and hence cannot fall much further, the measurement of bank competition using more traditional measures of competition is flawed. This is important because lower bank competition has detrimental effects on the pass–through of interest rate changes and reduces risk-taking by banks. Measurement of competition is important for a better understanding of the positive effects of competition on risk-taking and the interest rate pass-through of monetary policy (Marques-Ibanez et al. 2016, Van Leuvensteijn et al. 2013). To have a better idea of how interest rate regulation biases competition and its measurement, one can take China as an example. One of the key elements that made the Chinese banking sector different from the banking sectors in other industrialised countries has been the use of interest rate ceilings and floors. In 2004, the People’s Bank of China liberalised interest rates, by eliminating the deposit rate floor and the lending rate ceiling for the major banks. 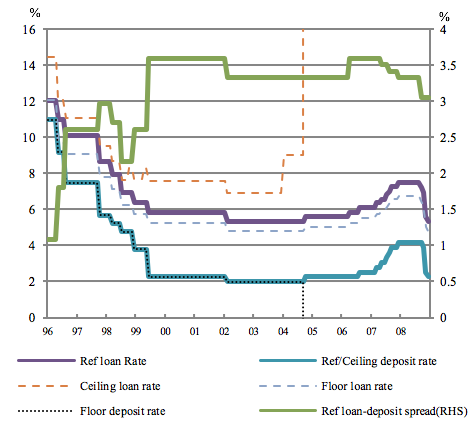 The liberalisation of the ceiling on the lending rate and the floor on the deposit rate in October 2004 implied that Chinese banks benefited from a more or less guaranteed minimum interest rate spread, due to the remaining floor on the lending rate and ceiling on deposit rate, while they faced no restrictions with respect to its potential maximum width (García-Herrero et al. 2005). Empirical research has suggested that the ceiling on deposit rates has been binding, putting them at a level below equilibrium (Feyzioğlu et al. 2009, He and Wang 2012, Ma et al. 2011). So the lending rate floor inhibited competition to some extent. 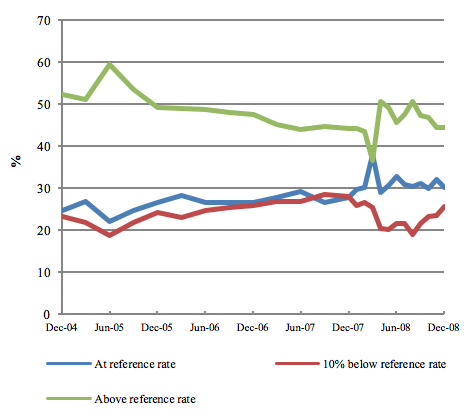 In fact, from December 2004 to December 2008, between 19% and 29% of all loans were made at the floor lending rate (see Figure 1). The more these interest rate ceilings and floors were binding, the more they affected the measurement of competition. Traditional measures of competition that are often used are the Lerner index and the elasticity adjusted Lerner index. Sources: CEIC database, Authors’ own calculations. All rates are one-year rates. The Lerner index reflects firms’ ability to set prices over marginal costs. Fierce competition will lower its level, as firms reduce prices towards marginal costs. In the extreme case of perfect competition, the Lerner index will be reduced to zero, while with monopoly it will reach one. The traditional Lerner index cannot distinguish markets that have high margins due to inelastic demand from markets that have high margins because they are less competitive, or perhaps collusive (Corts 1999). To overcome this problem, the elasticity-adjusted Lerner index has been developed (Genesove and Mullin 1998). More precisely, this measure normalises the Lerner index for the price elasticity of demand. These traditional measures of competition are biased in an environment with binding interest rate ceilings and floors. The intuition is that the price/marginal cost margin is influenced by the price ceiling by reallocating market shares from more efficient firms to less efficient ones, because more efficient firms usually have a higher Lerner index with higher profit margins. The reallocation of production to less efficient banks results in a lower Lerner index, which suggests higher competition, although competition actually is hampered by the price floors and ceilings. Ignoring binding price regulations also leads to inconsistent estimates for the elasticity-adjusted Lerner index (see also Salvo 2010). Binding deposit rate regulation in China affected the level of marginal costs of all banks and redistributed market shares between efficient and inefficient banks. We show in Xu et al. (2013) that this redistribution of output can result in both increasing and decreasing competition as measured by the (elasticity-adjusted) Lerner index, which makes it an inconsistent measure of competition under binding deposit rate regulation. Imposing a deposit rate ceiling should reduce the level of competition because more efficient banks cannot undercut less efficient rivals by setting deposit rates above the ceiling. Less efficient banks then are protected by the ceiling and are less likely to be forced out of the market. Abolishing or raising deposit ceilings should increase competition because more efficient banks can expand market shares at the expense of their less efficient rivals. The above analysis is closely related to the reallocation effect identified by Boone et al. (2007) and Boone (2008). They provide proof that intensified competition through more aggressive conduct or lower entry costs will reallocate output and profits from less efficient to more efficient firms. As more efficient firms usually have higher Lerner indices than less efficient firms, the Lerner index for the whole market may increase in response to more intense competition. The profit elasticity (PE) indicator,1 also known as the Boone indicator, is based on the notion that in a competitive market, more efficient companies are likely to gain larger market shares and higher profits than in a non-competitive market, because the inefficient banks are either pushed out of the market, have to adjust and become more efficient, or are taken over by more efficient banks. In all these events, the relationship between performance (in terms of market shares and profits) and efficiency (marginal costs) is strengthened, and in estimates of the relationship between performance and efficiency, the Boone indicator (or the parameter β in the literature) becomes more negative in more competitive markets. In this set-up, a more negative value suggests an improvement in competitive conditions. The Boone indicator is not biased by interest rate ceilings and floors, because it measures the relationship between profit differences and differences in marginal costs between banks. For the theoretical proof, see Xu et al. (2013). This measure correctly takes into account the reallocation effect from efficient banks to inefficient banks due to the interest rate regulation of ceilings and floors. Turning to the Chinese banking sector, we compared our estimates of the Boone indicator for Chinese bank lending markets with the development of the Financial Repression index (FREP) developed for China by Huang and Wang (2011). This comparison showed indeed that changes in the Boone indicator followed relatively well regulatory changes affecting the Chinese banking sector (see Figure 2), in contrast to the more conventional measures. 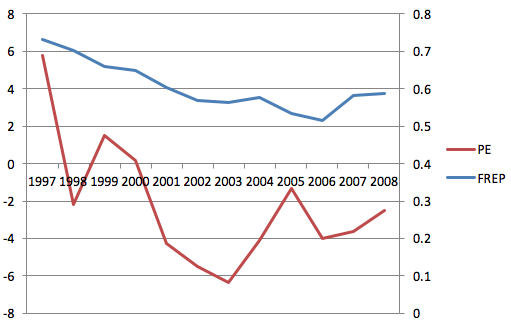 Note: FREP = Financial repression index. Sources: Authors’ own calculations. We are grateful to Yiping Huang and Xun Wang for sharing the values of FREP index with us. The unprecedented accommodative monetary policy stance that has been implemented across the world in recent years has pushed interest rates to the zero lower bound, and even into negative territory. As it seems increasingly unlikely that these new lows can be reduced further, they could be regarded as a floor on lending rates and a ceiling on deposit rates. Regarding the latter, as banks lend at very low interest rates, this creates de facto also a ceiling on deposit interest rates that banks can offer. The more these floors and ceilings have become binding, the more pronounced they will affect competition and its measurement with traditional measures. It means that more efficient banks face increasing constraints in offering lower lending rates than less efficient banks, which hampers competition, as it favours the latter banks. Also, the fact that deposit rates have been pushed to the zero lower bound, and in some cases even beyond, helps inefficient banks to operate for a longer period than otherwise would be feasible. So the longer a monetary policy of ever lower interest rates will be continued, the more competition will be affected negatively, because the more binding the floors and ceilings will become. These detrimental effects on competition are correctly picked up by the Boone indicator, while the earlier mentioned traditional measures of competition are biased in the context of the current unprecedented accommodative monetary policy stance. In other words, in an environment of exceptional low interest rates, the Boone indicator provides unbiased estimates of competition and indicates correctly that competition in loan markets has decreased. This may be associated with a reduced pass-through of interest rates and less risk-taking by banks, for example with respect to lending to small and medium-sized enterprises (Van Leuvensteijn et al. 2013, Marques-Ibanez et al. 2016). Authors’ note: The views expressed in the article are those of the authors and do not necessarily reflect those of their institutions Bank of Spain, APG, or any other institution. Boone, J., J. van Ours and H. van der Wiel (2007), “How (not) to measure competition”, Tilburg University, Tilburg Law and Economics Center (TILEC) Discussion Paper No.2007-014. Boone, J. (2008), “A new way to measure competition”, Economic Journal, 118, 1245 -1261. Corts, K. (1999), “Conduct parameters and the measurement of market power”, Journal of Econometrics, 88, 227-250. Fungáčová, Z., P. Pessarossi and L. Weill (2012), “Is bank competition detrimental to efficiency? Evidence from China”, Bank of Finland, BOFIT Discussion Papers No.31/2012. García-Herrero, A., S. Gavilá and D. Santabárbara (2005), “China’s banking reform: An assessment of its evolution and possible impact”, Banco de España Documentos Ocasionales No.0502. Genesove, D. and W. Mullin (1998), “Testing static oligopoly models: Conduct and cost in the sugar industry, 1890-1914”, RAND Journal of Economics, 29(2), 355-377. He, D. and H. Wang (2011), “Dual-track interest rates and the conduct of monetary policy in China”, Hong Kong Institute for Monetary Research Working Paper No.21/2011. Shortened version published as: He, D. and H. Wang (2012), “Dual-track interest rates and the conduct of monetary policy in China”, China Economic Review, 23(4), 928-947. Ma, G., Y. Xiandong and L. Xi (2011), “China’s evolving reserve requirements”, BIS Working Papers No.360. Marques-Ibanez, D., Y. Altunbas and M. van Leuvensteijn (2014), "Competition and bank risk: the effect of securitization and bank capital," ECB Working Paper Series No.1678. Salvo, A. (2010), “Inferring market power under the threat of entry: The case of the Brazilian cement industry”, RAND Journal of Economics, 41(2), 326-350. Van Leuvensteijn, M., C. Kok Sorensen, J. Bikker and A. van Rixtel (2013), "Impact of bank competition on the interest rate pass-through in the euro area," Applied Economics, 45(11), 1359-1380. Xu, B., A. van Rixtel and M. van Leuvensteijn (2013), "Measuring bank competition in China: a comparison of new versus conventional approaches applied to loan markets," BIS Working Papers No.422. Xu, B., A. van Rixtel and M. van Leuvensteijn (2016), "Measuring bank competition under binding interest rate regulation: The case of China”, Applied Economics, forthcoming. The Relative Profit Differences (RPD indicator is the theoretical model behind the empirical PE indicator.